No matter whether you are decorating for Independence Day or accenting an Americana style room in your home, a crocheted flag pillow will be the perfect finishing touch. This pillow pattern is a great project for both experienced crocheters and beginners. Click on the pattern photo below to download the free Adobe printable crochet pattern. It includes the pattern to crochet the pillow covering as well as instructions to create the pillow itself. The finished pillow measures 11 1/2" by 14 1/2". This pattern calls for traditional red, white and blue yarn. By adjusting the shades of each color you can create vintage, country and modern pillow styles. Vintage - Choose burgundy, navy blue and white yarn. Country - Dusty rose, soft blue, and off white will give the pillows a faded appearance. Modern - Bright red, muted blue (similar to denim) and bright white offer a crisp, original look. 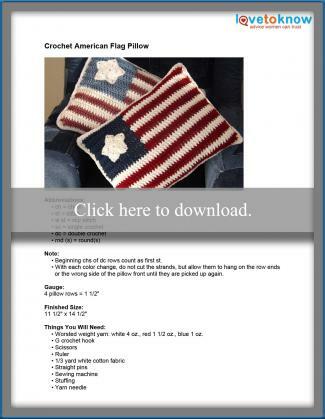 If you are looking for more Americana crochet patterns to match your new pillow for your home or patriotic holidays, give these projects a try. Petals To Picots shares an adorable star spangled crochet bunting you can use for draping over your mantel or hanging from your porch railing. Individual elements can be multiplied as many times as necessary to create your desired length. This pattern is suitable for a beginner. Quick and easy holiday coasters and cozies are fun to make. The patriotic can cozy pattern at Jessie At Home is no different. The cotton yarn used will wick up the moisture from cold drinks at all of your summer barbecues. This would be a great pattern for teaching a new crocheter the basics of crocheting circles. Ripple design in crochet is an old technique with big appeal. Try your hook on the ripple American flag afghan at All Free Crochet. Intermediate crochet experience is recommended for this project. Plan a relaxing evening with a hook, an Americana crochet project, and a patriotic movie. It's a great way to remember those who have served, or are currently serving the country.